We’ve been thinking about Chinese New Year lately. 2014 is all about the Chinese New Year of the Horse but animal crafts don’t seem to be our speciality, so far. Instead we opted for some simple Chinese New Year tea light holders. We collected some old (clean!) glass jars from the recycling bin, a bottle of PVA glue, paint brush and red tissue paper which I cut into small squares. I had to google why red is associated with Chinese New Year, apparently the colour red, which corresponds with fire, symbolizes good fortune and joy. 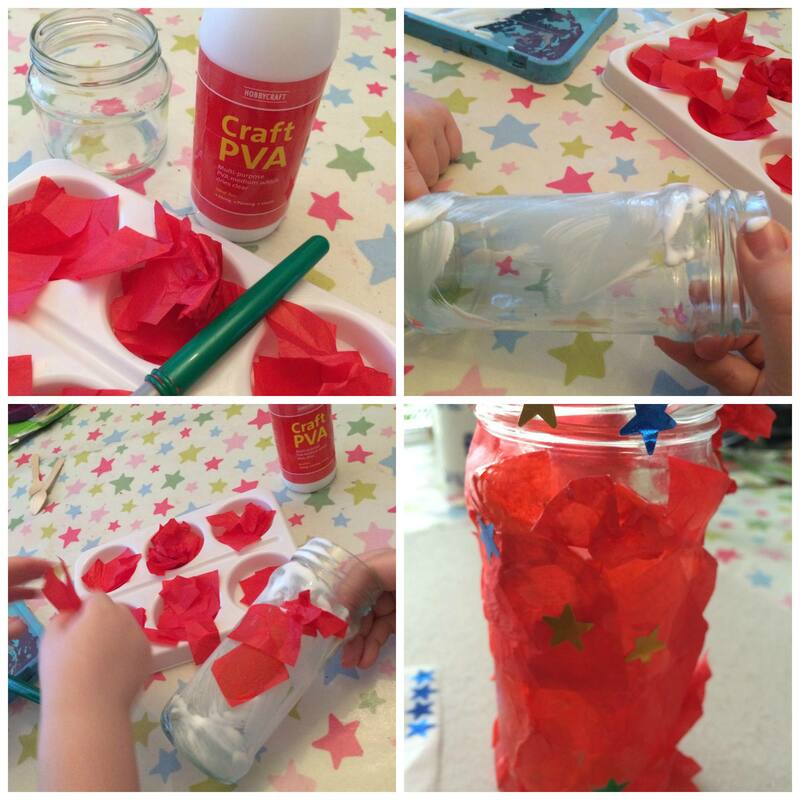 Then my son got to work, first covering a jar with a liberal amount of glue, and covering it in the red tissue paper. We made a couple as this is a really quick craft activity. We left them to dry for an hour before he added some colourful stars. Then I popped in a tea light and we sat back to admire the warm glow. 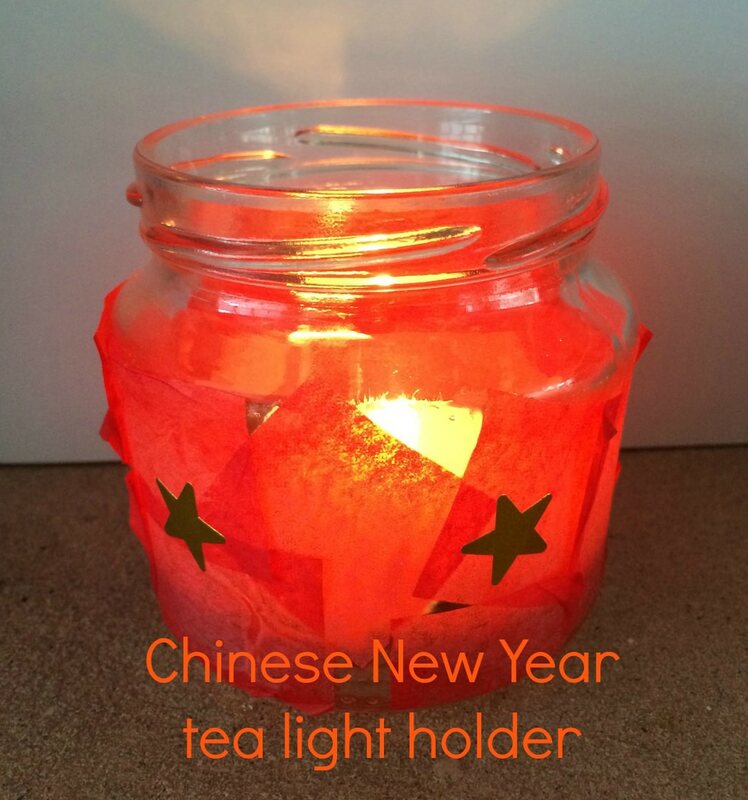 There are some lovely crafts for Chinese New Year. If you’re looking for some inspiration why not take a look at these: dragons from toilet rolls, firecracker decorations, a Chinese fan, dragons for a puppet show, more dragon shadow puppets, or candy cane horses. Oh my, that is so sweet! Thanks, it looks so pretty for such a simple craft. What a lovely idea. Simply love all candles and candle holders. Very sweet and so simple! Love it! Oh I bet they look pretty lit at night! What a lovely, simple idea. The finished one looks really pretty. Very cool & effective. I bet the kids were chuffed with themselves. This is so sweet! What a lovely way to celebrate! Lovely idea and so simple. What a lovely idea and so easy to make! What a cool idea! My two daughters would love this! Simple and easy to make and useful too! Thank you for a great post!